9 When they had crossed, Elijah said to Elisha, “Tell me what I may do for you, before I am taken from you.” Elisha said, “Please let me inherit a double share of your spirit.” 10 He responded, “You have asked a hard thing; yet, if you see me as I am being taken from you, it will be granted you; if not, it will not.”11 As they continued walking and talking, a chariot of fire and horses of fire separated the two of them, and Elijah ascended in a whirlwind into heaven.12 Elisha kept watching and crying out, “Father, father! The chariots of Israel and its horsemen!” But when he could no longer see him, he grasped his own clothes and tore them in two pieces. Yesterday was a little bit of a crazy day. A newspaper article came out about our homeless community and the city’s response. We put out a statement about the church’s response. We organized a prayer vigil. And here is where I need to clear a few things up….. The newspaper article – the city has put out into the world that they want to work with us. Our goal with the petition and the conversation was to delay the kicking out of homeless people. Sounds like that will happen. We have accomplished that goal and now we do want to, in fact, work with everyone to look for longer term solutions…past December. Church’s response – The email said it was a note from me. I wrote it but it was edited by Pastor Mark and other staff. I had talked with leaders and church council members. This was not written in a vacuum but with a team of people. I am sorry to hear that some thought I was acting on my own. If I have learned anything in ministry it is that we can’t work in a vacuum but only as a team. We have to have the Elijah’s who pass on to Elisha’s to part the waters. My hope is that the church is responding as faithful disciples to a hard place to be. The prayer vigil – Pastor Mark and I are organizing a way to respond out of prayer. This really isn’t a protest. This is a place for people to pray for a way forward together. If we are a church, we need to have space to pray and discern. This is the goal of the vigil. In order to move forward in anything, we have to be talking to God. 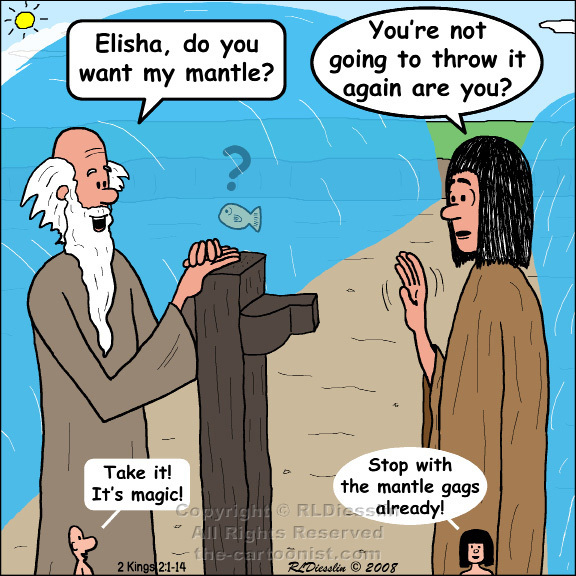 Elisha does it as he exclaims to God. How will he move forward without his mentor? God parts the waters…not the prophet. Overall Advent lessons from this moment – we must wait for change and sometimes the conversations get larger. I have to be willing to move and to listen. Sometimes we are called to pass the mantle and sometimes we are called to receive. Both are part of the larger movement. Are we willing to do both during this season?